Berglind María Tómasdóttir, hljóðfæraleikari og tónskáld, kynnir og leikur á hljóðfæri sitt - Lokkinn - sem hún hefur látið smíða út frá getgátum um tónlistariðkun Vestur-Íslendinga og kvennamenningu á upphafsáratugum 20. aldarinnar. Hljóðfærinu er skeytt saman úr spunaverkfærinu rokki og langspili. Stuttmynd Ivalo Frank, Echoes (2015), verður sýnd. Myndin er tilraunakennd tónlistarheimildarmynd sem er tekin upp á yfirgefnum hersvæðum á Grænlandi. Myndin mótast af hljóðum, formi og litum brattra fjallshlíða og segir (ástar)sögu tveggja manneskja sem hafa fundist á þessum stað - mitt í framvindu sögunnar, alþjóðastjórnmála og hernaðar. Andreas Otte, tónlistarfræðingur og lektor við Háskólann í Grænlandi fjallar um doktorsrannsókn sína á tengslum dægurtónlistar og tónlistarsenunnar í Grænlandi við mótun þjóðar og sköpunarkraft meðal tónlistarfólks í Grænlandi á síðustu áratugum. Erik DeLuca, listamaður, tónskáld og kennari, heldur performansfyrirlestur sem tekst á við þrjú umhverfislistaverk á Íslandi. Þessi þrjú verk, sem eru einnig vinsælir ferðamannastaðir, voru sköpuð af erlendum listamönnum og vekja spurningar um nýlenduhyggju, umhverfissiðfræði, tvíhyggju, náttúruvernd og rómantíseríngu erlendra listamanna á íslensku landslagi. Hópur kennaranema, með listkennslu sem valgrein, frá Háskóla Grænlands kynna hljóð- og myndverk sem byggist á reynslu þeirra og hugmyndum um Grænlenska þjóðernishyggju og sjálfstæði. Þorbjörg Daphne Hall kynnir doktorsverkefni sitt sem fjallar um íslenskan hljóm í íslenskri samtímatónlist og vinsældatónlist en sjálfsmynd þjóðar, ímyndir, landslag og náttúra eru útgangspunktar greiningar hennar. Boðið verður upp á umræður í lok dagskrár. Gestir eru hvattir til að taka virkan þátt! Þorbjörg Daphne Hall, lektor og fagstjóri tónlistarfræða við Listaháskóla Íslands stýrir vinnustofunni sem haldin er í samstarfi við Listaháskóla Íslands, Rannsóknarstofu í tónlist - Rít og Háskólann á Grænlandi. Þorbjörg Daphne Hall er lektor og fagstjóri tónlistarfræða við tónlistardeild Listaháskóla Íslands. Hún kennir tónbókmenntir, íslenska tónlistarsögu, rannsóknarþjálfun og akademísk skrif auk þess að standa að hádegisfyrirlestraröð deildarinnar. Hún er doktorsnemi í tónlistarfræðum við háskólann í Liverpool þar sem hún vinnur að verkefni um íslenskan hljóm í íslenskri samtímatónlist en sjálfsmynd þjóðar, ímyndir, landslag og náttúra leika lyklihlutverk. Leiðbeinendur hennar eru Sara Cohen og Holly Rogers. Andreas Otte er vísindamaður sem hefur fengist við rannsóknir á popptónlist og hefur rannsakað grænlensku popptónlistarsenuna síðan 2008. Hann skoðar tengslin á milli þjóðerni og popptónlistar. Berglind María Tómasdóttir er flautuleikari og tónskáld sem vinnur þvert á miðla. Í verkum sínum leitast hún við að kanna ímyndir og erkitýpur sem og tónlist sem félagslegt fyrirbæri. Sem flautuleikari hefur Berglind komið fram á hátíðum víðs vegar í Bandaríkjunum og á Íslandi. Berglind stundaði nám í flautuleik við Tónlistarskólann í Reykjavík og Konunglega danska konservatoríið og lauk doktorsprófi í flutningi samtímatónlistar frá Kaliforníuháskóla í San Diego árið 2013. Berglind er dósent við Listaháskóla Íslands. Erik DeLuca (f. 1985) lauk doktorsprófi í tónsmíðum og tölvutækni frá háskólanum í Viginíu í Bandaríkjunum. Hann er búsettur á Íslandi og er styrkþegi Amerísk-skandivaísku stofnunarinnar sem nýdoktor. Samhliða því kennir hann við Listaháskóla Íslands. Erik rannsakar og tekur viðtöl við tvo þekkta umhverfislistamenn Richard Serra og verk hans Áfanga á eyjunni Viðey og Tvísöng Lukas Kühne á Seyðisfirði. Ivalo Frank (f. 1975) er fædd í Grænlandi af dönskum ættum og er búsett í Berlín og Kaupmannahöfn. Hún er með meistaragráðu í heimspeki og félagsfræði frá Háskólanum í Lundi og vinnur sem myndlistarmaður og sjónrænn mannfræðingur. Frank hefur unnið myndir í ólíkum löndum og um ýmis málefni þar á meðal póstkóloníalisma og viðtöl við íbúa fyrrum Austur-Þýskalands. Verk hennar hafa hlotið margar viðurkenningar. The short film Echoes (2015) by director and film artist Ivalo Frank will be screened. 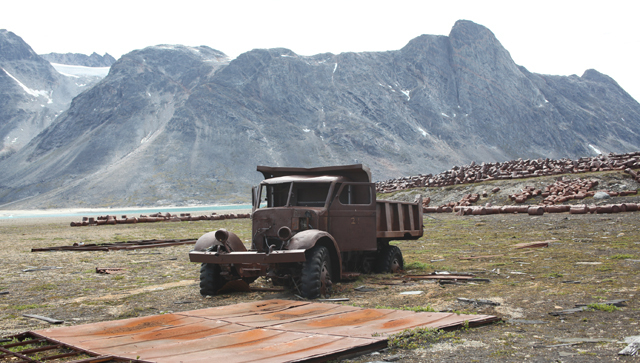 The film is an award winning experimental music documentary recorded on various abandoned military places in Greenland. The film is structured according to the sounds, structures and colours of the mosaic landscape of steep mountains. It tells the (love) story about two people who have met here, in in the midst of international politics and war history. Andreas Otte, musicologist and lecturer at the University of Nuuk presents his doctoral research on the popular music scene in Greenland, in an up-and-coming national perspective. How does popular music participate in the nation-building project, and can the nation as a project in fact work as catalyst for creativity among musicians. Erik DeLuca, artist, composer and teacher, gives a performative lecture that responds to three permanent environmental artworks in Iceland. These three works—which are also popular ecotourism destinations—were all composed by non-Icelandic artists and raise questions on colonialism, environmental ethics, the nature/culture dualism, conservation, and the long-standing issue of non-Icelandic artists who romanticize nature vis-à-vis Iceland’s landscape. A group of university students from the University of Greenland department of education, that have art as a chosen subject, present an audio-visual project on their experiences and thoughts on Greenlandic Nationalism and Independence. Þorbjörg Daphne Hall, assistant professor and head of music department at the Iceland Academy of the Arts, presents her PhD research on ´Icelandic sound´ of Icelandic contemporary and popular music through analysis of the relation to national identity and -image, landscape and nature. The programme finishes with an open discussion. Guests are encouraged to take an active part! Þorbjörg Daphne Hall, musicologist, runs the workshop which is held in collaboration with the Iceland Academy of the Arts, Research Chamber for Music - Rít and the University of Greenland. Þorbjörg Daphne Hall is program director and lecturer of musicology in the Department of Music at the Iceland Academy of the Arts in Reykjavík. She is a PhD student in music at the University of Liverpool where she studies under the supervision of Sara Cohen and Holly Rogers. Her research project focuses on the idea of Icelandic sound in contemporary popular music where national identity, images, landscape and nature play a large role. Andreas Otte is a researcher involved with popular music production and has been researching the Greenlandic popular music scene since 2008. He looks at the link between national identity and popular music. Berglind María Tómasdóttir is a flautist and interdisciplinary composer. In her works she examines identities and archetypes as well as music as social conduct. As a flutist she has performed in festivals worldwide. She studied flute in the Reykjavík College of Music and the Royal Danish Music Conservatory and concluded her doctoral degree in contemporary music performance from UCSD in 2013. Berglind is Associate Professor at the Iceland Academy of the Arts. Erik DeLuca (b. 1985) received his PhD in Composition and Computer Technologies from the University of Virginia and is currently based in Reykjavík as an American-Scandinavian Foundation postdoctoral fellow affiliated with the Iceland Academy of the Arts. He is researching, and intervening with two popular eco-artworks in Iceland: Richard Serra’s “Áfangar” on Viðey Island and Lukas Kühne’s “Tvísöngur” in Seyðisfjörður. Ivalo Frank (b. 1975) is born in Greenland to Danish parents and now resides between Berlin and Copenhagen. Holding a MA in Philosophy and Social Science from Lund University, she works as an artist and visual anthropologist. Frank’s work has been included in numerous international film festivals and has won a number of awards.